Where: Resource for London, 356 Holloway Road, London, N7 6PA. Aniridia Network UK Conference 2013 was an all-day event offering the opportunity to learn about aniridia and related conditions from the organisation and professionals in medical and related fields. 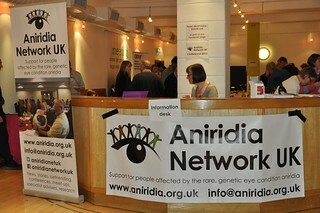 Attendees found out how others affected by aniridia deal with it every day. The conference was also a chance for to contribute to ANUK by volunteering or sharing ideas and experiences. Over 60 people from throughout the UK attended. We held the event at Resource for London near Holloway Road tube station, which is only a few train stops from central London main line train stations. Childcare was available. The day began at 9:30am with registration plus tea and coffee, ready for a prompt 10:00am start to presentations. The conference ended at 5:30pm. There was also an optional sport and social evening. presentations from expert speakers on subjects including genetics, surgery and benefits. Read a review and parent’s experience of the day. Videos of some of the presentations are available on the session pages. If you would like more information or to help with the next conference, contact our Conference Coordinator at conference@aniridia.org.uk.